The renovation of the Villahermosa Palace, the building that was to become the museum that would house the Thyssen-Bornemisza Collection, began in January 1990. The challenge was to adapt the palace, which had previously been offices for Banca López Quesada, into a building with all the right conditions (lighting, security, public spaces, etc.) and services required in a gallery. The project was an ambitious one and was led by the architect Rafael Moneo. 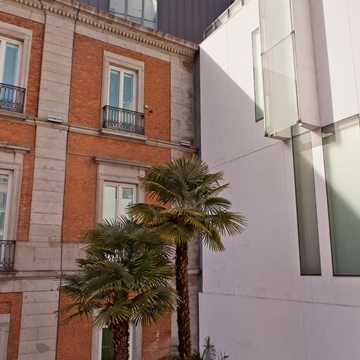 The main entrance leading on to the Carrera de San Jeronimo was moved to the garden on Calle Zorrilla, thereby restoring what had once been the north façade and giving the museum a less busy entrance. Now the north façade was the centre point of the new structure. This significant change ensured that the museum’s upper floor, which housed older paintings, enjoyed natural daylight. The other two floors, in which the rest of the collection can be found, look out onto to the Paseo del Prado. The proportions of the rooms, the carefully designed floors, the thick walls and the delicate stucco all are as similar as possible to original architecture of the palace. 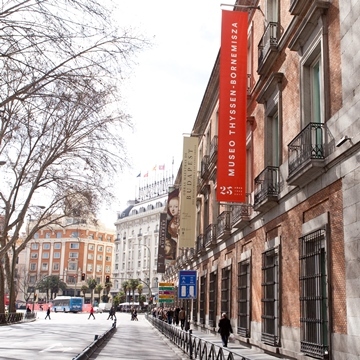 After a few years the museum was expanded to create space to exhibit the Carmen Thyssen-Bornemisza Collection. The acquisition of two properties adjacent to the Villahermosa Palace increased the exhibition space by 50% and offered the opportunity for all spaces and programmes related to the permanent collection to be improved. The team of architects that led the project were Manuel Baquero, Robert Brufau and the BOPBAA architecture studio. The idea was to merge the two separate buildings, the old and the new, into a single space, so that together they could host activities and tours. In order to achieve this, the buildings next-door to the Villahermosa Palace were partially demolished, maintaining only the rear galleries and the façades. The façades remained in keeping with those of the area, but a modern building, to be used as a further exhibition space, was built on the newly freed-up plot. The result was an L-shaped building mainly used for offices and internal services, connected to the Villahermosa Palace, the main exhibition area. The garden was turned into a kind of outdoor entrance hall for the museum, a meeting point and relaxation area. It is framed by the Villahermosa Palace, with the backdrop of the impressive new white façade.